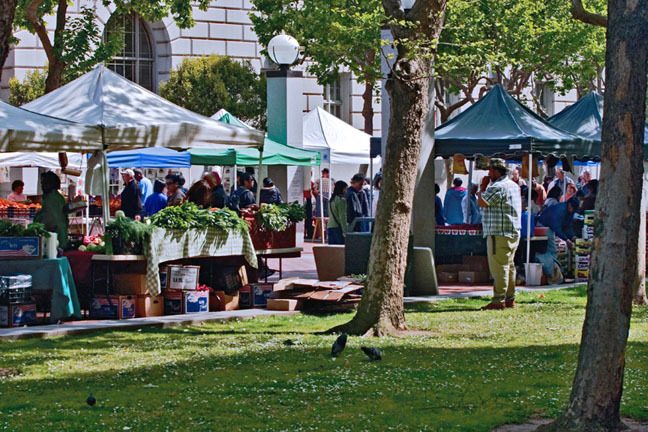 Marshall Square was a plaza that connected Market Street with City Hall Avenue,* a parallel frontage road for the old City Hall. When the old City Hall was destroyed by the 1906 earthquake and fire, the design for a new Civic Center demanded the redrawing of grid lines. City Hall Avenue was completely obliterated and Marshall Square became part of the Hyde Street extension to Market. 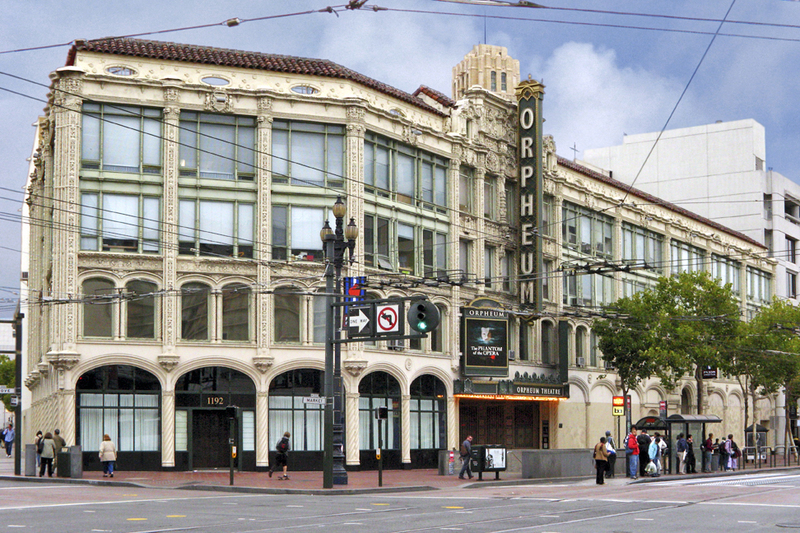 The Spanish Moorish office building and theater at the corner of Hyde and Market is the namesake of Marshall Square, though anymore it is known only by the name of its theater, the Orpheum. City Hall, circa 1890. Shot from Eighth Street just below Market, this view looks straight across the Pioneer Monument in the middle of Marshall Square to the old City Hall. Crowning its Baroque dome is the Goddess of Progress, an iron statue with a corona of electric light bulbs. 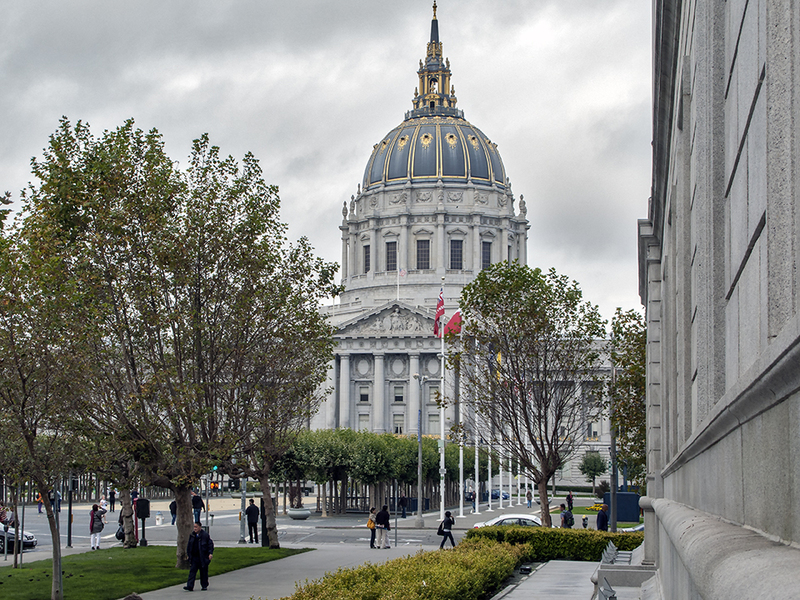 Designed piecemeal by seven different architects, shoddily constructed with compromised materials over a period of twenty-seven years at a cost of six million dollars, the old City Hall was a disgraceful mess, the malodorous* embodiment of municipal graft. 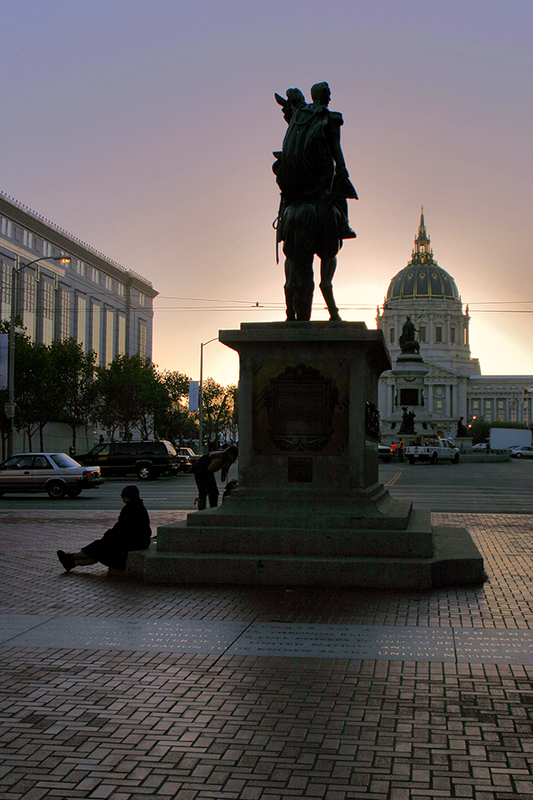 Nine years after its completion, it was all but destroyed by the 1906 earthquake and fire. *The stench of raw sewage frequently permeated the superstructure’s poorly ventilated chambers and corridors, a consequence of faulty plumbing. Erected in 1894 with money bequeathed by real estate magnate James Lick, sculptor Frank Happersberger’s Pioneer Monument mythologizes the story of San Francisco’s supposed “manifest destiny.” It is an unabashedly romanticized story of empire building ss told by the empire builders themselves,* that depicts Native Americans as a docile and subservient people conquered by the Argonauts, nom de guerre of pioneering gold miners. 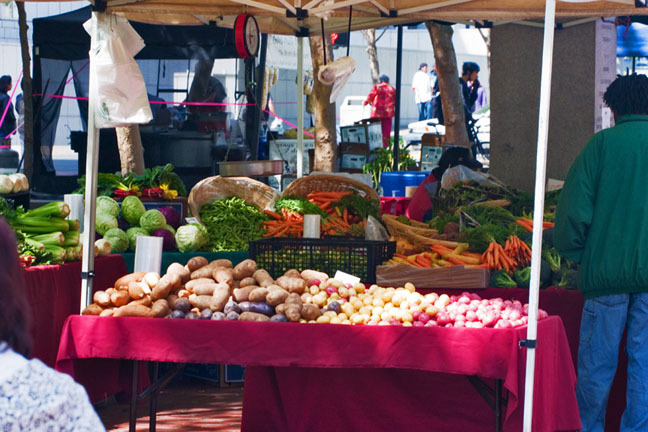 Contrary to both reality and Lick’s final wishes, the monument also places mining ahead of agriculture, both in order of importance, and sustainability. Taken from the Great Seal of California, the figure that crowns the monument is Minerva, Roman goddess of wisdom and sponsor of arts, trade and technology. As a goddess born fully grown, she symbolizes California’s direct attainment of statehood without first becoming a U.S. territory. 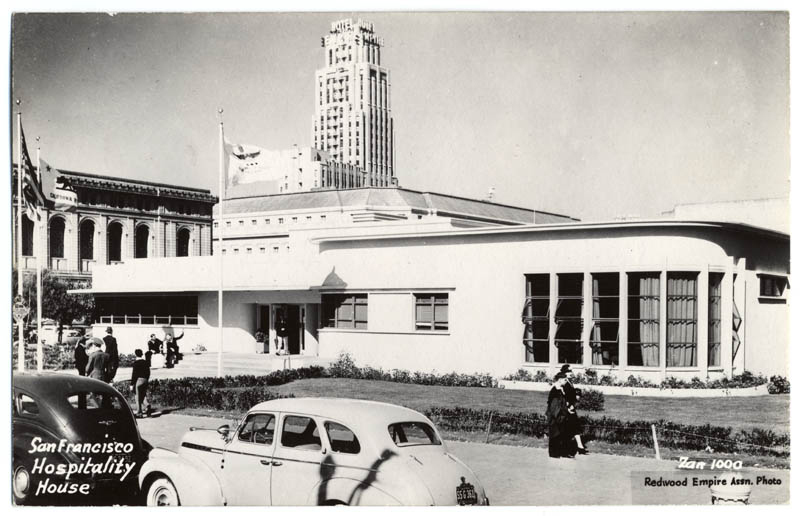 The new City Hall and the Civic Auditorium were the only Civic Center structures completed by 1915, just in time for the opening of the Panama Pacific International Exposition. The Civic Auditorium was in fact specifically designed for the PPIE and is one of the few exposition buildings still remaining. 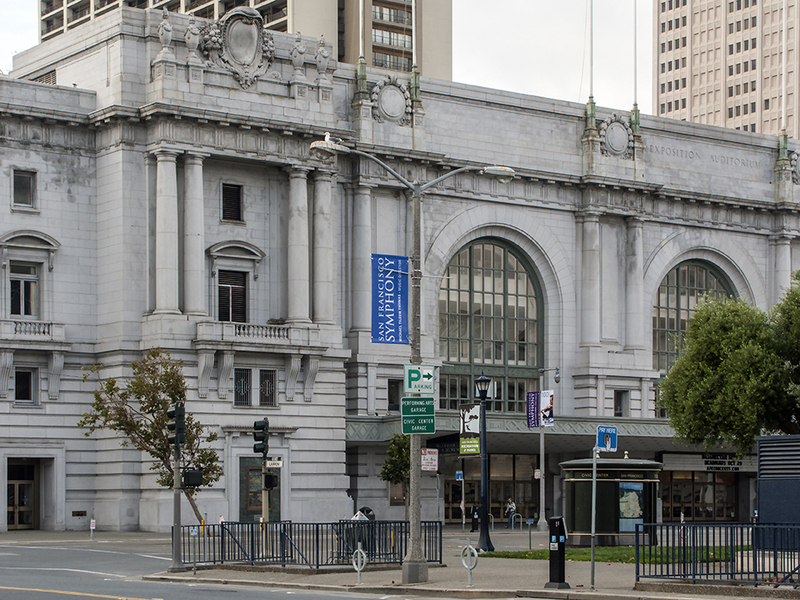 It was renamed the Bill Graham Civic Auditorium in 1992, in memory of the City’s renowned concert promoter. The beaux-arts Main Public Library was built in 1917 on the site proposed for the opera house. Following extensive remodeling under the direction of Italian architect Gae Aulenti, the building became home to the Asian Art Museum in 2003. The new Main Library, erected 1993-95 and opened in 1996, was built on the site originally proposed for a library. 1922 saw the opening of the California State Building at 350 McAllister, proposed site of the art gallery. 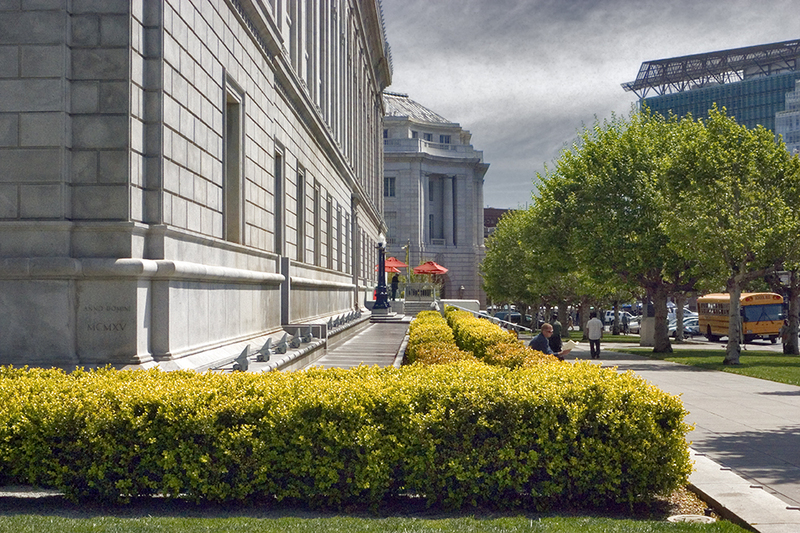 Today, the beaux-arts granite structure is home to the Supreme Court of California. 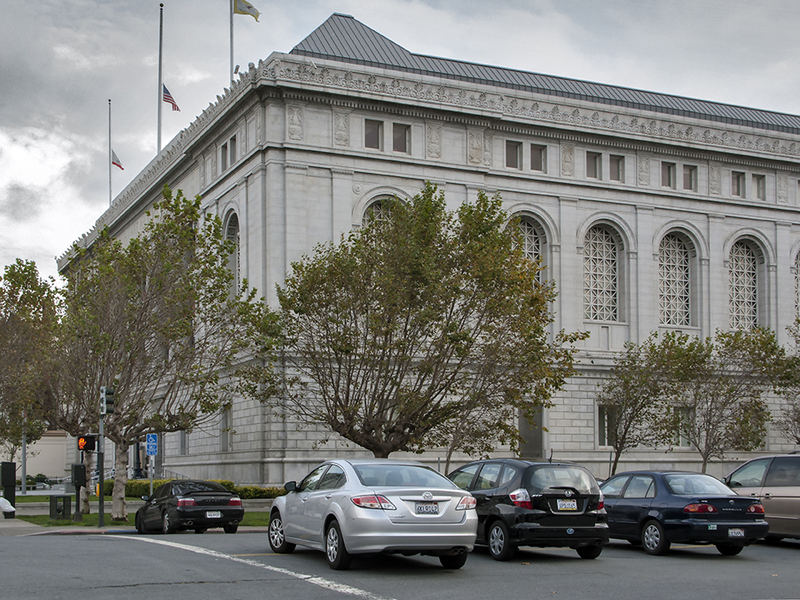 Opened in 1932, both the beaux-arts War Memorial Opera House and its twin sister, the War Memorial Veteran’s Building (home to the San Francisco Museum of Modern Art until 1994), were constructed on Van Ness Avenue, opposite City Hall. 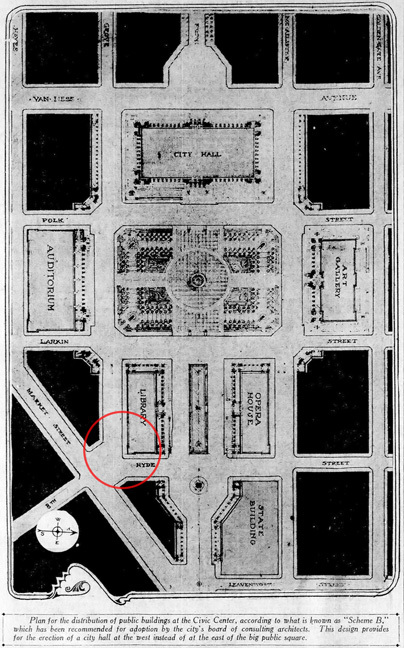 The site proposed for a state building, now part of the United Nations Plaza, is where the beaux-arts Federal Office Building was constructed between 1934 and 1936. New City Hall, circa 1915. Looking south from Larkin and McAllister, the new Civic Auditorium is in the background to the left. The block-long excavation in the foreground marks the site of the California State Building, completed in 1922. Now occupied by the General Services Administration, the old Federal Office Building was constructed near the site of the former Hall of Records. In 1975, the building became an integral part of the newly-constructed UN Plaza, a 2.6 acre pedestrian mall designed by Lawrence Halprin to commemorate the 1945 signing of the United Nations Charter at the War Memorial Opera House. The plaza was rededicated by visiting members of the UN General Assembly in 1995. Following much-needed renovations, it was again rededicated during World Environment Day in 2005. 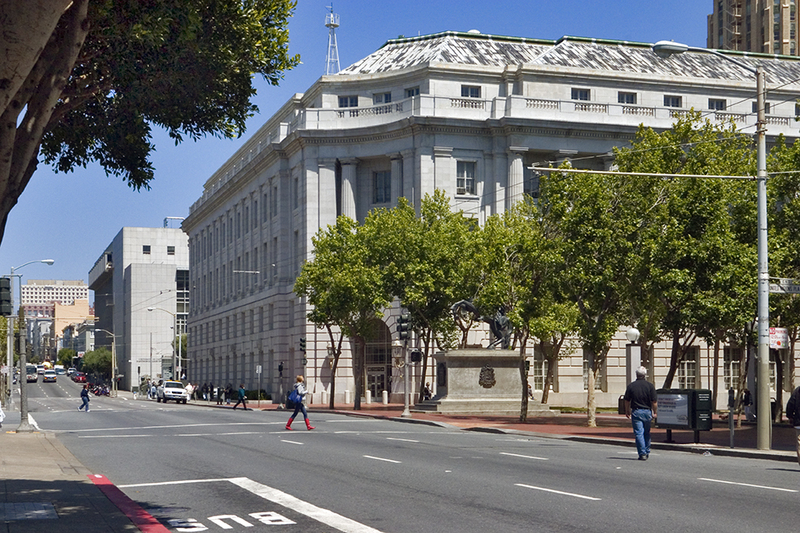 The new Federal Office Building is on Mission, across Seventh Street from the Ninth Circuit Appellate Court. 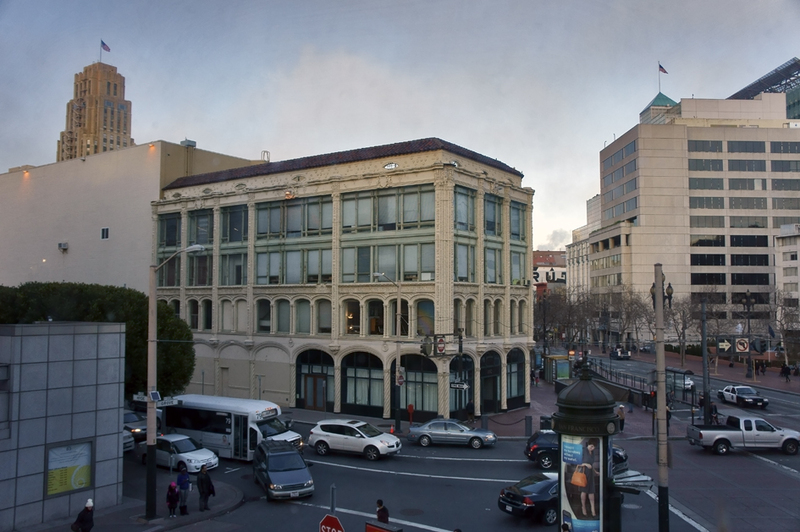 Completed in 1926, the Marshall Square Building is located on the northeast corner of Hyde and Market. 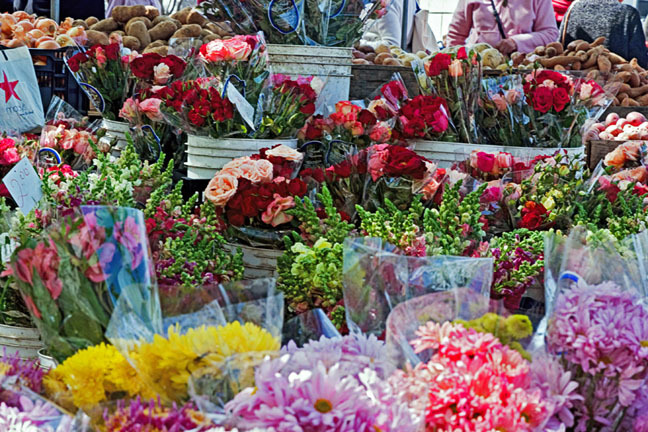 Until the early 1990s, the building’s storefront arcades were occupied by a pharmacy on the corner and various small businesses that added much to the character and color of Market Street. One business I particularly remember bore the name of its proprietor, “Mister San Francisco,” a dapper fellow with an extraordinarily long, waxed, and elaborately curled Snidely Whiplash mustache, who conducted off-the-beaten-path tours of the local night life. After the Marshall Square Building was purchased by its current owners, tenants were forced to leave, some sooner than others. Last to go was the corner pharmacy. While the theater thrived, the Marshall Square Building itself was neglected; characterized by darkened storefronts, empty save for odd bits of debris left behind by departed businesses. By the time the Pioneer Monument was moved to Fulton Street, every storefront was vacant and soon would be sealed and stuccoed-over. Where once were variety and commerce, there now are anonymous windows and blank wall, prosaic and drear. Marshall Square has faded from civic memory, and with antecedents thoroughly obscured, its namesake is only known as the Orpheum Theater. In the lower left of this photo is a corner of the new Main Library. Upon its opening in 1926, the theater was christened the Pantages, a vaudeville house that replaced the original Pantages Theatre at 939 Market Street. A few years later, it was sold to RKO and soon thereafter reopened as the Orpheum, a first-run movie house. From the premiere of This Is Cinerama! on Christmas Day 1953 until the final showing of Ice Station Zebra early in 1970, the Orpheum was San Francisco’s foremost Cinerama cinema. The theater was closed for a short time and then reopened in 1977 as a venue for live theater, but the conversion was unsuccessful and the theater was closed once again. It was purchased in 1981 by the Shorenstein Hays Nederlander Organization and since then has been a successful showcase for traveling Broadway shows. Thanks for your input, David. Much appreciated. FWIW I think the corner drug store in the Orpheum building was still open in the early 1990s. Certainly it survived the ’89 quake. Typo, now corrected. Thanks for catching it! Finally Marshall Square and the location of the old City Hall are clarified on line. The street called City Hall Avenue is hard to visualize, because it paralleled Market Street, confusing the grid, but adding the map really helps. There is one error to correct. The Hall of Records, completed in 1872 was the cornerstone of the City Hall complex and built like a masonry battleship. Dolan Wrecking Co. lost money on the job in mid-October 1916, trying to demolish the building. This building was gutted by the fire of ’06, but had no structural damage, unlike city hall which was built over a 25 year span, with multiple unwise design changes and corrupt contractors. Thanks for the article and with the changing of the dating of the demise of the Hall of Record from “by 1914”, you’ve got everything correct. Correction(s) made, John. Thanks very much for the the information. Glad you enjoyed the post! This is a fantastic write-up. Looking at Google Earth and Wikipedia, though, it looks like the Pioneer Monument was able to stay put in its pre-earthquake location in the corner of the newly laid-out block, which otherwise remained empty until the current library was built. Only then, around 1993, was the monument moved to the middle of Fulton. You’re right about when the Pioneer Monument was moved, but the block where the new main library stands was formerly occupied by the Hospitality House. Great bit of research here, thanks for sharing!